350 uses of the artwork you purchased. This license is only valid for ONE listing of artwork that you purchased from Elle P. Studio. With this license, you can NOT exceed over 350 uses PER ONE Project/Product. 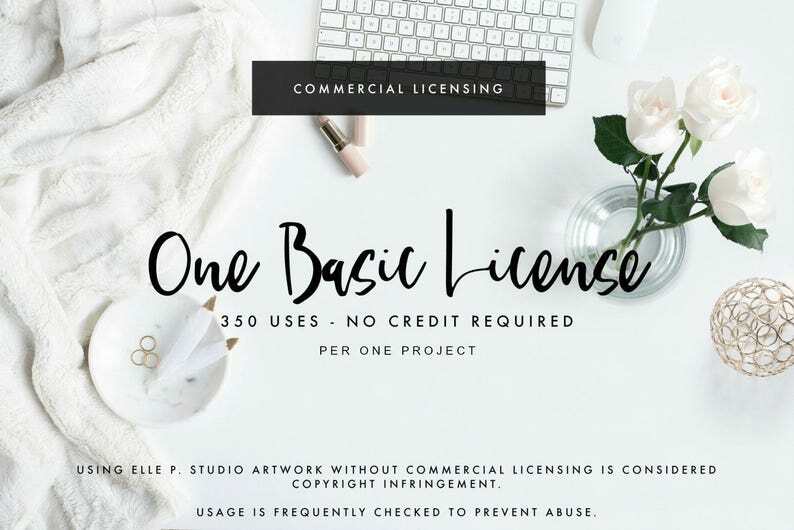 However, with this license, you may not claim Elle P. artwork as your own, re-sell, or re-distribute Elle P. artwork in its original or modified version as a digital template (such as clip arts, digital papers, sticker sheets). You may not distribute this design as free downloads, giveaways, gifts, and you may not re-sell, share, claim, transfer, loan, copy, or give away this file. Please note, that we frequently do check usage to prevent abuse. If you are caught using Elle P. Studio artwork with out a commercial licensing, you will be notified to pay the owed licensing fees, and your shop will receive a copyright infringement strike with Etsy. Elle Papadopoulos (Elle P. Studio) is not liable against any claims, losses or costs associated with any damages that occur due to you using Elle P. Studio artwork. Purchasers hereby agree to compensate Elle Papadopoulos (Elle P. Studio) for all expenses that may be incurred should you breach any of our terms of the agreement. Users acknowledge that Elle Papadopoulos (Elle P. Studio) does not claim any representations or assurances of non-infringement and does not make claim to have received releases from any brands, designers, or manufacturers for use of products, registered trademarks, logos or intellectual property portrayed in the artwork. Users agree that neither Elle Papadopoulos (Elle P. Studio) shall be liable for any damages resulting from the use of any of the artwork provided. Elle Papadopoulos (Elle P. Studio) shall not be liable for any claims related to, or resulting from, your use of the artwork, which may or may not have been modified by you, or combined with any other content. Artwork remains the copyright of Elle Papadopoulos & Elle P. Studio, and may not be reproduced in any way without the written permission of Elle Papadopoulos . Mass & 3rd party production does require approval by Elle Papadopoulos. By purchasing a commercial license, the copyright is not transferred to you. You may not sell, lease, loan, transfer, claim, share, or give the image to a third party to use in any way. Once purchased - the file(s) is licensed to one (1) user. Links to downloads containing Elle P. Studio artwork may not be shared, loaned, borrowed, given away, or sold. Elle P. Studio artwork purchased as is, or custom created may NOT be revised/edited/altered/modified, or changed in any shape, way or form without the written permission of Elle Papadopoulos. If you are unsure, by all means, you can always shoot us a message! As always, thank you so very much for shopping Elle P. Studio! © 2017 Elle P. Studio. All rights reserved. Artwork purchased as is, or custom created may not be altered/revised/modified. What products can I NOT make with your artwork? Along with the items mentioned above, Elle Dolls/Baby Elle Dolls can not be used to make commercial products other than Planner dashboards/covers, or planner stickers. Greeting cards, Calendars, Gift Tags, Notepads/Notebooks/notecards/art prints (anything that looks like an art print )/Journaling Cards/Journals/Sticky Pads, etc. If there's an item you don't see mentioned here, please contact us for approval. It is your responsibility to read our policies prior to making any purchases, as we do not offer refunds for digital downloads and/or licensing. Can I use you art to make planner stickers that I plan on selling? Are the fonts used as "place holders" included? Unfortunately, they are not. We do not sell our illustrations as layered PSDs. Can I create digital planner stickers with your artwork? Please message us about this. What happens if I'm caught using your artwork and haven't bought commercial licensing? Failure to purchase commercial licensing will result in a copyright infringement notice filed with Etsy, as well as full payment of over-due commercial licensing fees, which will be charged at $100/per each listing of artwork that was used without commercial licensing. If licensing was purchased with previous artwork, and was not used, you can not "transfer" licensing "uses"- NEW licensing must be purchased for a new project. Why am I receiving an RTF? Where’s my download? An RTF is a rich text format file( aka a word document) Since Etsy has a 20MB size limit and most of our files are high resolution files, we have to upload them to our Google drive. Many shops do this, as this is an industry standard. The link to your download, as well as an explanation to all this is, can be found in your RTF file. Can you send me my files in PDF? We only offer files in PNG and JPEG format, however, there are many file converters you can use by doing a simple google search. How many commercial licenses do I need to purchase? It depends on how many listings of artwork you purchase. For each listing of artwork you purchase, and want to use commercially, then a commercial license also needs to be added. So if you purchase a "Clipart Bundle" and the matching "Paper Set", then you must purchase either 2 Basic commercial licenses, or 3 Large licenses, along with the artwork. Any artwork purchased is final sale. Due to the nature of the files, we do not offer returns. Do I need commercial licensing for personal use? No, You only need a commercial license when you plan on using the artwork for commercial purposes. If you are purchasing the artwork to make yourself something, such as a Facebook cover, and do not plan on selling the design, then you only need to purchase the artwork - you do not need to purchase licensing. Planning 101 Clipart Bundle /Planner Clipart Bundle -21 Clipart files Included! Hater Spray Illustration (Does Not Say HAIRSPRAY) /Witty Clipart/ Fun Illustration/Planner Icon / 2 Skintones included! Cozy n' Chic Fall Clipart Illustration / Scene Illustration / Fall Clipart Theme - BOTH Skintones included! Girls Night In Clipart Bundle /Optional Valentine's Day Clipart Bundle -32 Clipart files Included!